I don't really know if they are sisters are not. I just thought it was a catchy title. This was copied from a tin-type picture. You can see a little dent or a scratch on the metal. The young ladies names are Gene Lee and Lula Wright. I cannot find their names indexed in my genealogy program. 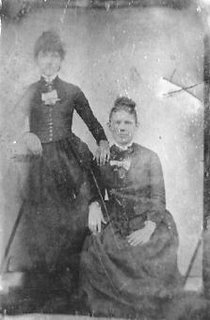 The closest I have is a great great aunt of Anna named Annie Lou Wright who was born about 1870 - which, would make her a young lady when tin-types were still being used. I can see that a name Annie Lou would be nicknamed Lula. She had eleven siblings with these sisters' names: Ellie, Effie, Debie, and Odella. Notice the last name Odella? The picture of Gene and Lula was with the same batch as one with Odella. Cousins & Friends Meet for 1st Time in Macon Co.